When it comes to printing there are several aspects to consider. Printer model, Inks, Paper type, Application used, Media Type, ICC profiles and last but not least Display Calibration. My own personal experience is to get these three parts right in order to succeed in the color management. This step cannot be overlooked, thus you have to calibrate your display. The reason being, most displays are too bright and have a blueish tone to them. There are several good Calibration devices out there. One note on white level. When you calibrate your display this is a very important setting you do before proceeding with the calibration. You set the target brightness of white in cd/m2. You will have to try out what works best for you, but a good starting point is 80-100cd/m2 for correct brightness. For more information click here. If you can’t get the correct color profile from the paper manufacturer for your printer then I would suggest buying a Spectrophotometer so you can create your own ICC profiles. This applies to Lightroom CC. You have three dialogues that you have to through to make sure everything is set up correctly. First up is the “Page Setup” dialog. After you have installed the driver for your printer you will see different paper sizes available for you. You can also create custom ones if you have to. The second part you have to go through is the “Print Setting”. There are several settings you can change here but for color management you’ll only have to choose the correct media type. For my printer I can choose six different types. This will vary depending on your printer. Choosing the correct media type cannot be stressed enough. The media type is important because it controls all features in the printer related to how the ink is laid down and how paper is handled through the printer. For best result you will have to try out the different types. The third part is Lightrooms own printer settings. Again i will skip all settings not related to color management. If your printer can handle 16-bit then choose that. 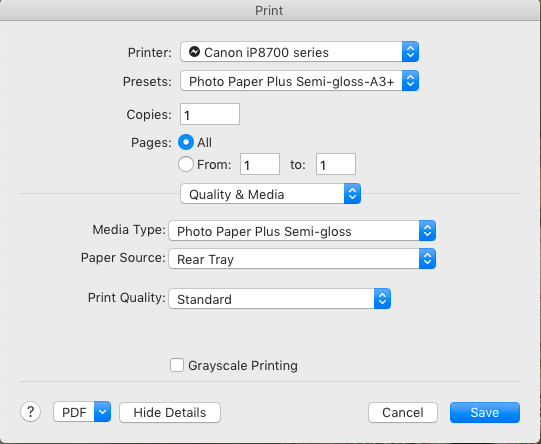 Choose the printer profile for the paper you are using (this will negate the printer color management and lets Lightroom control the color management) and select perceptual or relative intent. In most cases perceptual works just fine. If you still feel that the print was a bit too dark you can adjust the brightness here as well. Hopefully you will now have a print that you are satisfied with. There are of course a tone more information about color management but I wanted to keep this as simple as possible.